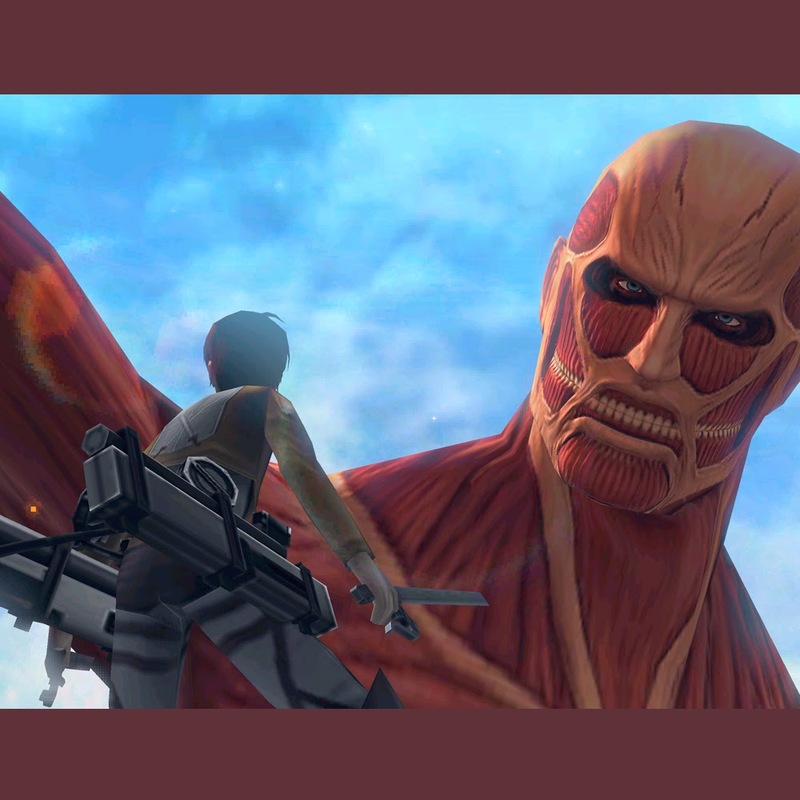 Screen shot from upcoming game adaptation for anime hit, "Attack on Titans"
Many apologies for the delay in posts! I was ill, in bed, for more days than I want to admit. I'm on the mend and decided to tackle kaiju in video games, specifically the non-combat, kaiju vs. kaiju, style games. We start with an article by The New Hampshire published earlier today. I like zombie games as much as the next person, but after almost a decade of brains, guts, and gore, I’m ready for a change of pace. Let’s see a new genre for a new generation of consoles. Sony, Microsoft and Nintendo promised big changes and new games with their next-gen. hardware, and so far all three haven’t really lived up to the ‘new’ games part. It may seem a bit random, but I think the gaming world is ready for a kaiju genre. Mr. Kost continues to root for kaiju praising the success of the genre in the movies and mentions a few of the previous fighting style games. The kaiju film genre has proven to be incredibly resilient, surviving for over 50 years with countless entries, but it’s often overlooked in the gaming world. That’s a shame, because the few kaiju games we have seen give us a glimpse of a robust genre with many styles of gameplay. The recent adventure game “Attack of the Friday Monsters” for the 3DS shows us what a light-hearted kaiju game could look like, placing the player in the shoes of a young boy enthralled by the giant monsters. “Colossatron,” another recent game for mobile devices, is about a giant, robotic beast destroying city after city with intense puzzle mechanics. And let’s not forget the PS2 fighting classic, “War of the Monsters,” which gives the player a whole roster of kaiju to fight and play as (there are also many “Godzilla” games that mimic this style of gameplay). Mr. Kost seems to lament in the last paragraph, "I wish I could give more examples of how kaiju games could be a success, but the fact is there really aren’t any." We disagree. Although you won't get any argument from us regarding the validity of kaiju games as a genre, there are some great successes outside the fighting-style of kaiju games. This is based on the popular anime and manga with the same title. The gist of the story is human-like kaiju have invaded the planet and humans have found a way to defend themselves against them. They use big walls around the city and have these grappling hooks on their wist that allow them to climb and incredible speeds. When the Titans get too close they kill them. Even in the simple networked game, it allows for all dsorts of cool game play. The video below splices some of the anime scenes in the beginning to give you a taste for what the anime is like. Here's a 3DS game based on the same title, which shows how having a kaiju in game play totally changes the dynamics of a game. If you have any kaiju games that you think have gone unnoticed and worth mentioning let us know in the comments below or on our facebook page fb.com/EverythingKaiju.